Easter Monday celebrates the day after Easter Sunday. This holiday occurs the Monday after Easter Sunday. On Easter Monday many people spend time quietly with their family and friends. 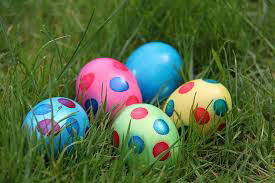 It's common for families to have an Easter egg hunt and spend time outside enjoying the nice spring weather. Most buildings are closed however airports and railway stations are open. This holiday used to be celebrated for a whole week in the church. But now Easter Monday does not have any religious importance. Provides the dates for holidays for the calendar year for Italy.